Asian Art dealer Yangki Ackerman runs Dharma Art an Asian Art Gallery focusing on Asian Art & Tibetan Art in the historic Southern California community of Santa Monica. Asian Art Dealer Based in Southern California. DHARMA ART is located in Costa Mesa, in Southern California. We are dealers in Asian Antiques, Asian Art and other finery of Southeast Asia, primarily from Tibet and the Himalayas. We can be reached at 714-852-3680. Dharma Art is run by Yangki P. Ackerman, who has been a dealer in Asian Art for nearly twenty-five years. In 1980 she managed the Mandala gallery of Indian and Southeast Asian Art in Kathmandu, Nepal. 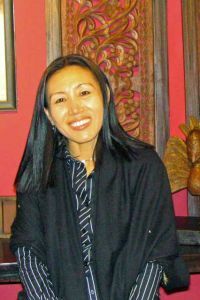 Yangki specializes in art of Tibet, India and China. Located in Southern California since 1984, she has been a broker to other dealers and museums. She has sold works of art for and to top dealers In New York, Spinks and sons (London), The Los Angeles County Museum, The Chicago Art Institute, The Metropolitan Museum of Art (New York) and the Asian Art Museum (San Francisco). She has also sold numerous pieces to several prominent devotees, such as Steven Seagal, Goldie Hawn, Richard Gere, Sharon Stone, Jon Voight and others. More recently, she has been asked by decorators to assist them in designing and decorating entire rooms and special areas in an Asian motif. With the growing popularity of Asian art and design, she is now focusing on decorative arts and antiques from Southeast Asia. Yangki also is the proprietor of Dharma Shrines which sells contemporary hand made Buddhist Alaters and other Tibetan furniture which are made in Lhasa, Tibet and imported solely by Yangki into the US. Pleas visit us there to see our exquisitely designed and hand crafted line here. Exquisite Fine Art, Antiques, and Curios from Tibet and Southeast Asia.